To learn about how to become a sponsor, please click here. The Horror Writers Association (HWA) is pleased to announce Samhain Publishing as the Platinum Sponsor for the 2013 Bram Stoker Awards® Banquet. The Banquet is part of the Bram Stoker Awards Weekend incorporating World Horror Convention in New Orleans and will be held on June 15, 2013. Don D'Auria, executive editor for Samhain Horror, and Dawn Martin will be representing the publisher. "We're excited to renew our sponsorship of the iconic Bram Stoker Awards Banquet. These are prestigious awards and we are proud to support the efforts of the Horror Writers Association in honoring outstanding horror writing," D'Auria said. Launched in 2011, Samhain Horror (www.samhainhorror.com) publishes both established horror authors and the genre's most compelling new voices. HWA President Rocky Wood welcomed Samhain Publishing's support: "This continuing generous commitment by Samhain Publishing is greatly appreciated by HWA and I am sure by all our members. Samhain continues to be a highly professional and innovative horror publisher at a time when the publishing industry is in flux. We look forward to welcoming Don D'Auria and his team at the Banquet. I can also announce we will again be streaming the Banquet live on the internet. Last year there were over 700 live viewers worldwide, in addition to the over 200 in attendance at the actual banquet. It is through the support of sponsors such as Samhain Publishing that we are able to provide the live streaming. All our Guests will attend the Banquet, including Ramsey Campbell, John Joseph Adams, Caitlin R Kiernan and Jonathan Maberry. Jeff Strand returns as our MC, which promises yet more entertainment for the masses!" 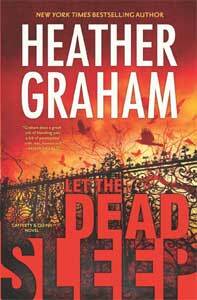 The Horror Writers Association (HWA) is pleased to announce Let the Dead Sleep by Heather Graham as the Gold Sponsor for the 2013 Bram Stoker Awards® Weekend, to be held in New Orleans from June 13-16, 2013. Heather Graham is a New York Times bestselling author and a former Vice President of the HWA. Appropriately, her new novel, Let the Dead Sleep, is set in New Orleans! It will be released in April 2013, just in time for the Convention. An object of desire? Or of fear? It was stolen from a New Orleans grave - the centuries-old bust of an evil man, a demonic man. It's an object desired by collectors - and by those with wickedness in their hearts. One day, its current owner shows up at Danni Cafferty's antiques shop on Royal Street, the shop she inherited from her father. But before Danni can buy the statue, it disappears, the owner is found dead...and Danni discovers that she's inherited much more than she realized. In the store is a book filled with secret writing: instructions for defeating evil entities. She'd dismissed it as a curiosity.until the arrival of this statue, with its long history of evil and even longer trail of death. Michael Quinn, former cop and now private investigator, is a man with an unusual past. He believes that doing the right thing isn't a job - it's a way of life. And the right thing to do is find and destroy this object weighted with malevolent powers. He and Danni are drawn together in their search for the missing statue, following it through sultry New Orleans nights to hidden places in the French Quarter and secret ceremonies on abandoned plantations. HWA President Rocky Wood welcomed Heather's support: "Heather is a great supporter of the HWA and the horror genre. Her generous support will fund a dance party with live music for all convention goers on the Friday night; as well as nibbles to fuel us through the mass signing immediately before the party. We appreciate her support." Heather Graham also writes as Heather Graham Pozzessere and under the pen name Shannon Drake. She has written over 150 novels and novellas, has been published in approximately twenty-five languages, and has over seventy-five million books in print. Her website is at http://www.eheathergraham.com/. The Horror Writers Association (HWA) is pleased to announce Dark Regions Press as a Supporting Sponsor for the Bram Stoker Awards® Weekend 2013. Chris Morey, Dark Regions Press's Publisher (http://www.darkregions.com) said, "Dark Regions Press is thrilled to be a sponsor of the HWA and the Convention. For its twenty-seven years in business, Dark Regions Press has been proud to publish horror fiction, poetry and artwork. We recognize the HWA as an important group that keeps us all organized. The HWA furthers the horror genre, industry and all of our creative drives. Plus, they know how to throw a great convention. Our lasting gratitude goes to the HWA." HWA President Rocky Wood welcomed Dark Region Press's support: "This sponsorship from a long-time and respected horror publisher is greatly appreciated by HWA and I am sure by all our members. Dark Regions Press goes from strength to strength at a time when the whole publishing industry is re-aligning. We look forward to welcoming them in New Orleans." Dark Regions Press is an independent specialty publisher of horror, dark fiction, fantasy and science fiction, specializing in horror and dark fiction and in business since 1985. They have gained recognition around the world for creative works in genre fiction and poetry; and were awarded the Horror Writers Association's 2010 Specialty Press Award and the Italian 2012 Black Spot award for Excellence in a Foreign Publisher. They produce premium signed hardcover editions for collectors as well as quality trade paperbacks and eBook editions. Their books have received five Bram Stoker Awards from the HWA. Dark Regions Press have published hundreds of authors, artists and poets, including Kevin J. Anderson, Bentley Little, Michael D. Resnick, Rick Hautala, Bruce Boston, Robert Frazier, W.H. Pugmire, Simon Strantzas, Jeffrey Thomas, Charlee Jacob, Richard Gavin and Tim Waggoner. The Press has staff throughout the country, working virtually but also has an office in Ashland, Oregon from where they ship orders and maintain the primary components of the business. The Horror Writers Association (HWA) is pleased to announce JournalStone as a Supporting Sponsor for the Bram Stoker AwardsÂ™® Weekend 2013. The Weekend Convention will be held at the Hotel Monteleone in New Orleans, Louisiana from June 13-16 2013.